Autumn is just around the corner. That's what the calendar would tell us anyway. There are a few indications of the subtle transition to fall around Hoe and Shovel. One has to be paying attention closely to notice as, in typical Florida flashion, it eases up on us ever so slowly. 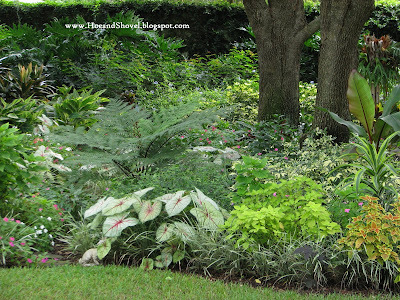 The sunny days remain intense albeit in this Florida garden the length of them is a little shorter with the dawning light starting later and the evening darkness falling sooner. Is there a more sure sign that autumn is on its way than when Golden Rod is blooming along the roadsides? It is every where, all of a sudden, these past few weeks. 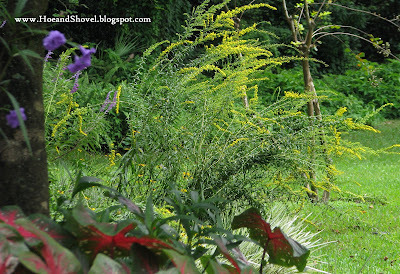 And at Hoe and Shovel Florida's native species Seaside Goldenrod, Solidago sempervirens was added to the (so-called) wildflower garden back in March. Its delilghtfully bright yellow blooms are clambering with tiny bees day-in and day-out. This is the ONLY time of year when the squirrels take a short break from their acrobatics trying to steal the bird's food from the feeders. 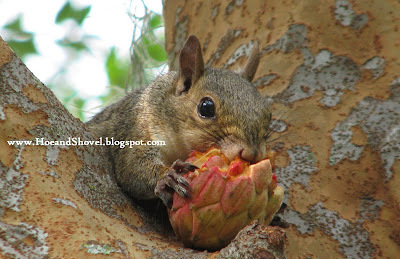 Grrrr... little rodents with plenty of natural seed pods to chew ... for a while anyway. 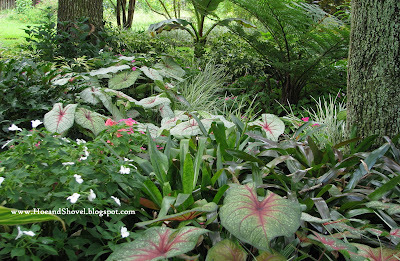 Have you seen enough of the caladiums this year? I'm happy to report they are faithfully lasting through September. Most are still making a very nice showing of varied color while displaying their summer textures throughout the landscape. September's garden probably doesn't look much different than it has the last couple of sweltering months. Florida just doesn't give over to autumn in ordinary ways. I'll be glad when the cooler temps decide to make a visit but we are prepared to wait patiently for that autumn change, too. September's sun is helping the front lawn renovation fill in nicely. It is hard to believe the rapid growth actually. Looking back at the photos from just a month ago it's amazing how fast it's growing. Do you see the beginnings of the Muhlenbergia capillaris, purple muhly grass blooms in the upper right hand corner? They are so light and fluffy right now they almost don't show up in the photo. But I'm tickled purple they are blooming! Another sure sign autumn is on its way. Wonderful pictures! Now I'm here in Florida, I shall be looking out for all the wonderful plants ... and as for the birds.... I'm in heaven, so hope you'll drop in on my blog while I'm here. I see little tell-tale signs of Autumn around here. My Caladiums are holding there own right now. I did see the Muhly grass...Frances posted it today too. It is a spectacular grass! Glad you are tickled purple. Your garden looks so lush and beautiful Meems. You are an inspiration. I feel like I should get out there and start working in my garden. It is so darn dry right now. There are a lot more signs here on Whidbey Island in the PNW. I have been gathering fallen leaves to place in my flower press. I wouldn't have thought that you all would have many Fall signs YET. When I lived in FL and Texas---I don't remember seeing much fall until about November.. BUT--I wasn't into gardening at that time--so probably didn't pay much attention. Your yard is totally AWESOME, Meems. I posted Sept. pictures from our yard today. A local bank just put in purple muhly grass and the blooms are at their best in the am when the low angle of the sun shows through best. I will watch to see how this plant does through the dry season. Better than the Blue Daze I see next to the Coontie. Blue Daze must have additional irrigation in the Keys to succeed. Meems, great post as always. I think I felt the humidity drop a percentage point or two today. Sometimes when I look at the sky in the late afternoon it looks just like Autmun,but then I feel the heat and humidity and I know it's still a few more weeks.Waiting impatiently,I must say. Just so beautiful. Your beds look so peaceful. 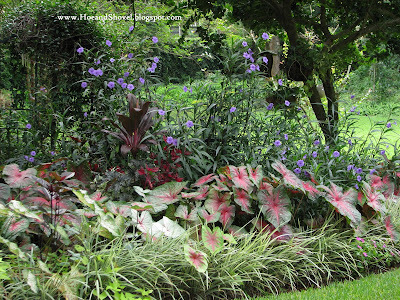 Your caladiums just make them pop. Beautiful gardens as usual. I saw the "purple" grass. It sure is pretty. I received my Miscanthus Purpurascens today. I sure hope it does like I want. I'm trying some different grasses. I like the way they look. My caladiums are slowing down. A few little hints that Fall in on it's way. we are in that time also when subtle hints are here as well. i am wishing it came a little quicker but having lived in fl a majority of my life i have learned some patience when it comes to the weather. love how your front in filling in...if we could all be such great gardeners...your ability to stick things in the ground...watch them then come to life and flourish is incredible. my purple grasses have done very well......i just wish i had planted more....next year. they are so pretty blowing in the wind. Your garden always looks so beautiful. 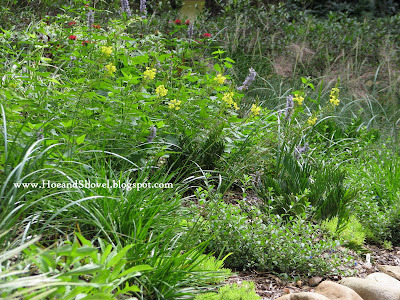 Your garden looks so fresh (unlike around here in my summer-weary garden). 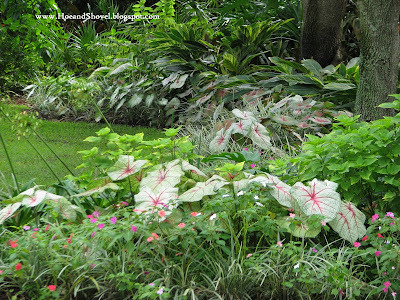 I never tire of seeing your caladiums. Hi Meems, beautiful photos. I got some caladiums this season, insprired by your beautiful plants. Turns out they don't like cold (40-50- degree) nights and haven't done very well. I'll try them again next year. I did end up with three different golden rods. Had no idea there are about a hundred different varieties.